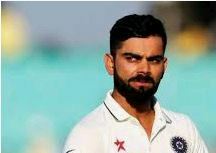 STORY: Indian skipper Virat Kohli on Wednesday (December 05) India would bring their ‘A’ game from the first ball that would be played at the Adelaide Oval against Australia in the first test and look to build on a positive start. Kohli has plenty of respect Down Under having plundered former Australian captain Michael Clarke’s side for 692 runs during the 2014/15 series. “They still have the skill to dominate at home. We’re not taking anything for granted,” Kohli told reporters at Adelaide Oval. With scorching heat forecast for Thursday (December 06), Kohli said Pandya’s absence would be a blow but he backed his quicks to pick up the extra burden. Meanwhile, Australian captain Tim Paine said Paine said the hosts would be inclined to bat first if he won the toss against counterpart Virat Kohli. Paine also confirmed that fast bowling all-rounder Mitchell Marsh had been omitted and the hosts will go into the match with six specialist batsmen.